Chest congestion is the accumulation of excess fluid and mucus in the lungs. A person suffering from chest congestion may experience cough, chest pains and difficulty breathing. Severe chest congestion is audible and can be heard as a crackling in the chest. Chest congestion can be caused by post-nasal drip, bronchitis or pneumonia. Treatment may require prescription drugs, over-the-counter medication and home remedies. Postnasal drip is an accumulation of mucus in the sinuses that drips into the back of your throat. If the mucus does not result in a productive cough, the mucus may slide down into the lungs and cause chest congestion. Taking an over-the-counter expectorant should relieve the chest congestion by causing the mucus to become thin and easier to cough up. Since postnasal drip is often caused by allergies, taking allergy medication should prevent future chest congestion. Bronchitis is an inflammation of the lining of the bronchial tubes. Bronchitis is either caused by the cold virus or by bacterial respiratory infection. The primary symptom of bronchitis is chest congestion with a cough that produces green sputum. Bacterial bronchitis can be treated with prescribed antibiotics, and chest congestion should clear up in two to five days. Viral bronchitis cannot be treated with antibiotics, and the chest congestion will have to be treated symptomatically. Pneumonia is an inflammation of the lungs caused by bacterial, viral or fungal infection. Symptoms of pneumonia can mimic a severe flu with fever, aches, decreased appetite and chest congestion. Severe pain when coughing can be a complication of pneumonia. Pneumonia will cause a cough that produces sputum, and in severe cases blood. 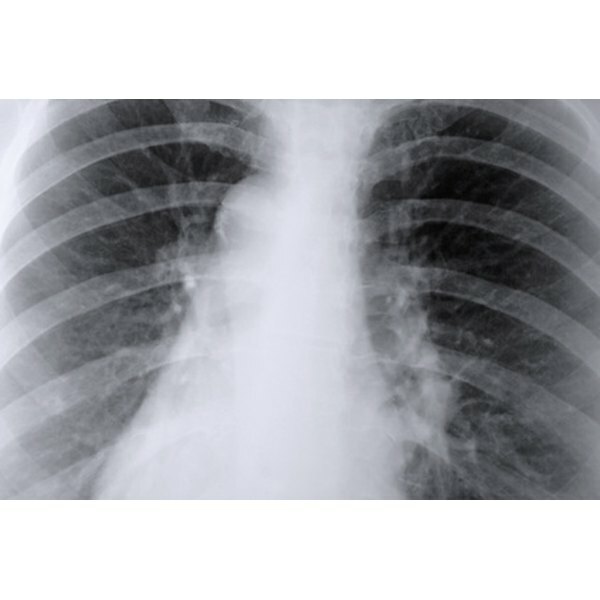 A pneumonia diagnosis can only be made by a doctor through chest X-ray. Like bronchitis, bacterial pneumonia can be treated with antibiotics. Fungal pneumonia should be treated with anti-fungal medication. Viral pneumonia, however, cannot be treated with antibiotics and must be allowed to run its course with treatment of symptoms. When you visit your doctor, your blood oxygen levels will be evaluated. If your blood is carrying less than 95 percent oxygen, you may be hospitalized for treatment. If your blood oxygen levels are good, you may treat yourself at home. The goal in treatment of chest congestion, no matter the cause, is to thin out the mucus so that it can be coughed up easily. There are two major medications that can help achieve this. Cough expectorants will thin out the mucus so it is easier to cough up. If you purchase your own, make sure that you purchase an expectorant as opposed to a suppressant. Suppressants are for dry coughs with no chest congestion. Your doctor may prescribe an albuterol inhaler. Albuterol is a bronchial dilator. Dilating the bronchial tubes will allow more air to enter your lungs. This is especially helpful for the pneumonia sufferer, as it will make breathing less painful. If the doctor decides that hospitalization is not necessary, you may be sent home with a few prescriptions and told to return if symptoms worsen. There are three home treatments that provide relief quickly. Hydrate your body. Drinking plenty of clear fluid will help thin out the mucus as well as keep you hydrated through your illness. Use a cool mist humidifier. Use distilled water in a cool mist humidifier as much as possible. The cool mist will keep your airways from drying out and keep your mucus thin. Sleep with your back propped up. Sleeping in a somewhat upright position will help you take in oxygen easier. Lying on your back will cause the mucus to settle at the back of your lungs where you have less muscle control.